"No matter how changed their shapes, no matter how large they've grown, they will multiply as quickly as the tiny insects from which they spring. They will overrun all of Africa." 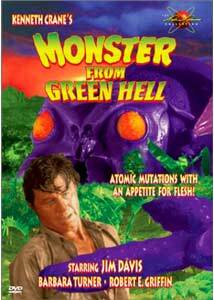 The 1950s genre of giant mutated insect movies was in full swing when Monster from Green Hell hit the drive-ins. An odd combination of that breed of movie and the jungle epic, it has a certain naive charm that makes one like it despite its goofiness. Rocket scientist Dr. Quent Brady (Jim Davis, best known as patriarch Jock Ewing from Dallas) and sidekick Dan Morgan (Robert E. Griffin) are conducting experiments to determine the effects of cosmic radiation on life by firing various critters two hundred miles up and then recovering them. One rocket, containing a nest of wasps, escapes their control and after spending 40 hours bathed in radiation, crashes in Africa. Soon reports of monsters come from an area of Africa known as Green Hell. Brady and Morgan set off on an expedition to find these monsters, which Brady believes are mutated versions of his wasps. Many adventures ensue, set to the backdrop of copious stock footage. As usual for 1950s sci-fi, the science is not only weak but downright boneheaded. Dan Morgan, engaged in experiments to test the effects of radiation on test subjects, neglects to notice that a guinea pig has changed color, a lizard is in a trance and a crab has grown to double its normal size! Plot holes are not sufficiently explained, such as the detour the safari takes to the mission of Dr. Lorentz (Vladimir Sokoloff), which takes them additional weeks while the giant wasps are running amok. But it does give the picture a female interest in the form of Lorna Lorentz (Barbara Turner). Pleasantly, no romance develops between her and Brady. Annoyingly, the finale comes via deus ex machina instead of anything the characters do, making their adventure completely irrelevant. The special effects are pretty poor. The monsters hardly look like wasps at all (though one can put that down to mutation, I suppose). They don't move at all plausibly and look like the rubber that they probably are made of. There is a very good stop motion sequence of one of the wasps fighting a giant snake; this forms the effects highlight of the picture. Nearly half of the running time has to be eaten up with stock footage of natives, jungle animals, volcanoes and the like, with an end result that there is really precious little new footage here. Davis makes an excellent craggy action hero, causing one to wonder why he wasn't more visible in Hollywood. As he trudges through the jungle, he even scratches his pits, something I can't say I've ever seen in any other movie. Sokoloff as the Albert Schweitzeresque Dr. Lorentz gives a sympathetic portrayal that seems out of place in this kind of genre film. Turner and Griffin don't have much to do except stand around. Image Transfer Review: The full-frame black and white picture is quite attractive. The source print suffers from little damage beyond the occasional speckle. The stock footage is, as usual, in poor condition, with plenty of blotches and less than crisp clarity. The new footage is sharp and attractive, with deep blacks and very good shadow detail with appropriate contrasts. Audio Transfer Review: The original mono audio is supplied, and it sounds surprisingly good. In particular, there is excellent bass response in the sequences involving jungle drums and explosions, far more than would be expected from a 40-year-old mono track. Hiss and noise are negligible and easy to disregard. Dialogue is clear throughout, and the music has warmth and fullness usually missing from a dated mono mix. An excellent presentation of the material. Extras Review: Other than a trailer for the main film and for five other DVDs in the Wade Williams Collection, there's nothing here. Chaptering is the standard 12 stops, which is adequate for a picture this brief. A decent example of the Giant Bug Movies of the 1950s, with copious stock footage and dubious science. It's good campy fun and not inappropriate for kids, although the effects will be considered laughable by those brought up on CGI. Both a nice audio and video transfer, but nearly nothing for extras.